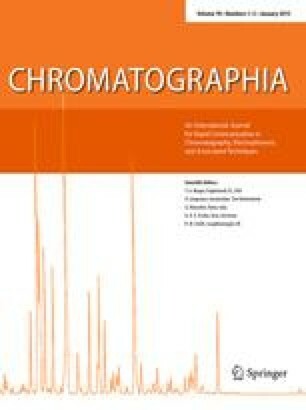 A molecularly imprinted polymer has been developed which subsequently demonstrated an ability to selectively retain darifenacin (UK-88, 525-S) from aqueous acetonitrile when used as a stationary phase in HPLC columns and as a packing in solid-phase extraction cartridges. The imprinted polymer is applicable to a wide range of analytical methods including extraction from plasma, purification of radiolabelled UK-88,525, chiral separations and separation of metabolites and structural analogues. The polymer is able to extract darifenacin directly from a protein-precipitated human plasma/acetonitrile (1:1 v/v) mixture with 100% recovery. The imprinted polymer can also effect a repurification of14C-labelled darifenacin. The drawbacks of molecular imprints for ultra-trace bioanalysis (in the sub-nanogram/mL range) are discussed. These centre on the difficulty of removing all the template from the polymer and the consequent effects of template bleed on assay precision and accuracy when used as solid-phase extraction cartridges. Possible solutions to this problem are considered. Presented at: Affinity Chromatography Conference, Cambridge, UK, July 1–3, 1997.